Just Plains is a rather easy and short stage in the game Wario Land: Shake It! It is the sixth stage in the game (Excluding secret stages). It is found in Wiggly Wilds. The stage takes place at an African-like plain with the sunset shown in the background. 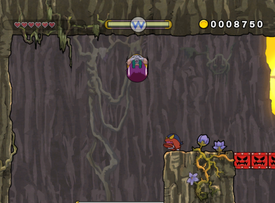 There are many bars in which Wario can swing on to get to higher ledges and coins in the level. Some of the level also takes place in a cave. After exiting the cave, Wario will once again be in the plains but bombs are put around the area. Touching one of the bombs will make it self destruct and hurt Wario. Wario will once again enter a cave, where he will find the Checkpoint Block and the caged Merfle. As usual, the player must make Wario free the Merfle and run to the beginning of the stage to exit. Beat the stage without taking damage. This page was last edited on January 16, 2019, at 10:42.